The CVOTM or Custom Vehicle Operations lineup delivers the best of the best. 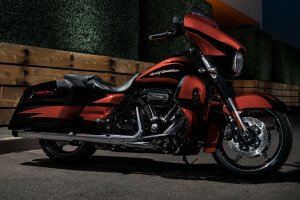 The CVOTM Street Glide® is a premium touring motorcycle like nothing else on the road, so if you want the latest features, the boldest style, and the most power, then you need to ride this new model here at Rawhide Harley-Davidson® today. 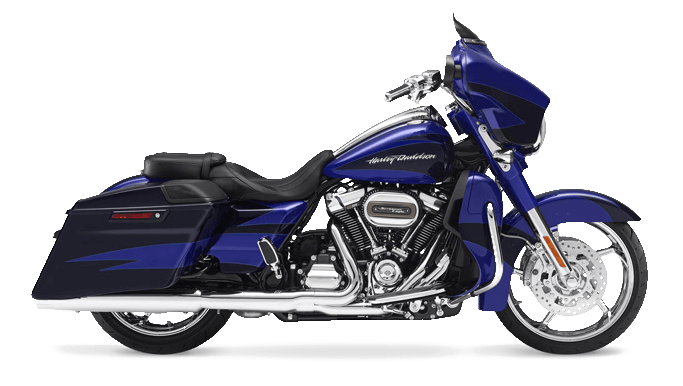 We know that riders will fall in love with the CVOTM Street Glide®, so check it out in Overland Park now. This bike is designed to devour mile after mile of tarmac. It’s a dream to ride, whether you’re cruising around Lenexa, or around the country. Milwaukee-EightTM 114 V-Twin Engine: The biggest, most powerful V-Twin created for a Harley-Davidson® is also one of the smoothest, coolest, and most efficient engines as well. This is an all new, completely reengineered engine that provides top-shelf performance and unbeatable durability. 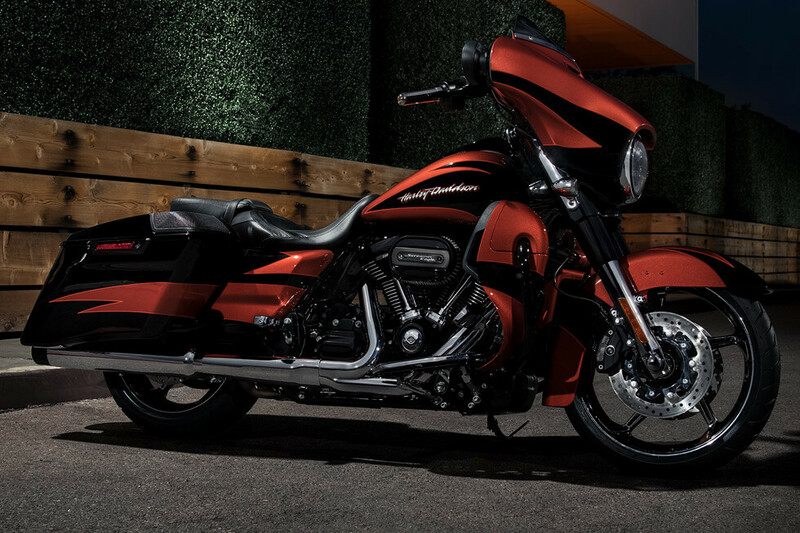 You don’t know what you’re missing until you get a chance to ride the new CVOTM Street Glide® with Milwaukee-EightTM 114. Milwaukee-EightTM Overview: Add some displacement, bump up the compression ratio, and upgrade cooling, and what you get is an engine that delivers more power, quicker acceleration, better cooling, superior reliability, and a better ride than ever before. This new engine is even designed around you – with improved counter-balancing and ergonomic design, it delivers a better ride quality. Brembo® Brakes: Brembo® makes the best brakes in the business, and here you’ve got a powerful set of dual front rotor brakes and 4-piston front and rear breaks to deliver the performance you expect. Dunlop® Multi-TreadTM Tires: The Dunlop® Multi-TreadTM tires have a sticky compound on the sides for added cornering traction and a hard-wearing rubber in the middle, providing durability through those long miles. Electronic Sequential Port Fuel Injection: For more power and more efficiency, the CVOTM Street Glide® gets modern fuel injection with heated oxygen sensors. Premium Touring Shocks: This bike offers premium single tube nitrogen charged emulsion shocks to provide the ultimate in handling and comfort. ReflexTM Linked Brakes with ABS: Wheel lockup is a thing of the past, thanks to the sophisticated anti-lock brake system that’s standard on the CVOTM Street Glide. Six Speed Cruise Drive: You’ve got six gears to take advantage of the wide powerband of the Milwaukee-EightTM and the tall top gear lets you enjoy quiet, smooth highway cruising. New Suspension: This brand-new suspension in the front and rear offers a superior ride quality, and it’s easily adjustable. 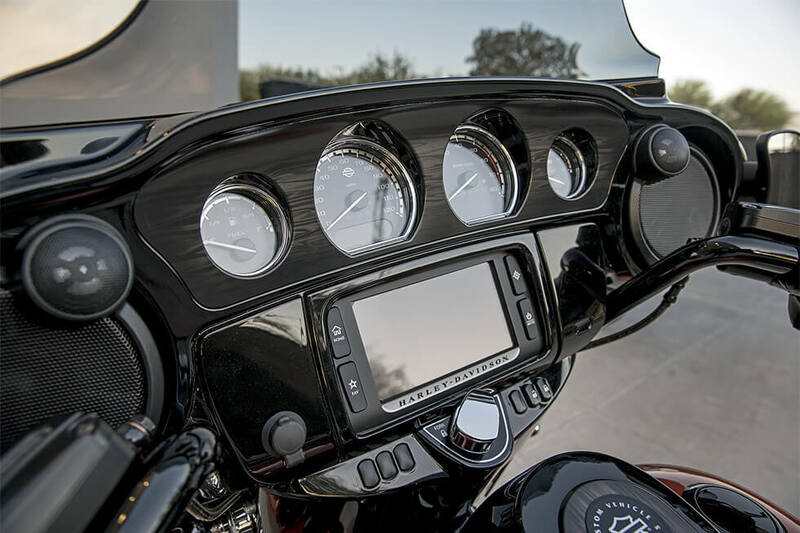 You only have to turn a single knob to change the ride quality, making it perfect for fully-loaded rides as well as short trips without any cargo. 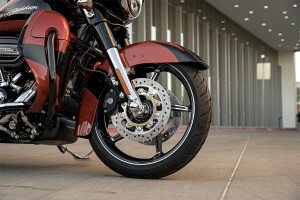 Ventilator Elite Air Cleaner: The Milwaukee-EightTM 114 gets a classic Ventilator Elite Air Cleaner Cover with custom badging, that truly sets this bike apart. The CVOTM Street Glide® is equipped with some of the latest high tech infotainment features to keep you connected and on the right track when you’re far from home. 6.5-inch Boom!TM Stage II 3-Way Speakers: You’ve got more volume and clarity with these big front speakers. Custom Tuned Static and Dynamic Equalizer: The audio system is designed to reduce static and provide crystal clear sound, even when you’re out there on the highway. Dedicated 300 Watt Front Amplifier: With 300 watts headed for the speakers, you know you’ve got all the volume you’ll ever need. The CVOTM Street Glide® is a super premium bike, and it is always going to feel special. 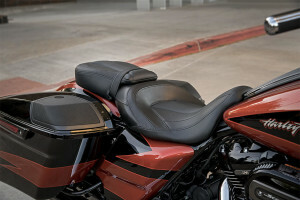 Two-Up Seating: The sculpted two-up seat on the CVOTM Touring is the ultimate in touring comfort, with its low height, sculpted shape, narrow neck, and deep contoured bucket. 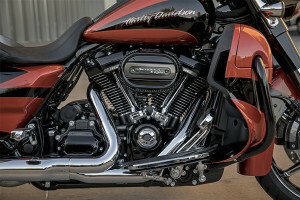 Wide Set Handlebar: With the CVOTM Street Glide®, you can enjoy the perfect posture. Spread your arms out, grab the grips, and feel the stress melt away. This ergonomic design is meant to let you stay in the saddle all day long. Extended Saddlebags with 5”x7” Boom!TM Speakers: You’ve got more speakers in the saddlebags, and that’s not all. 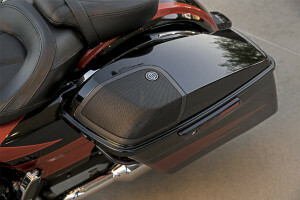 The saddlebags also include smart liners, so it’s easy to move your gear from the bike to the bed. 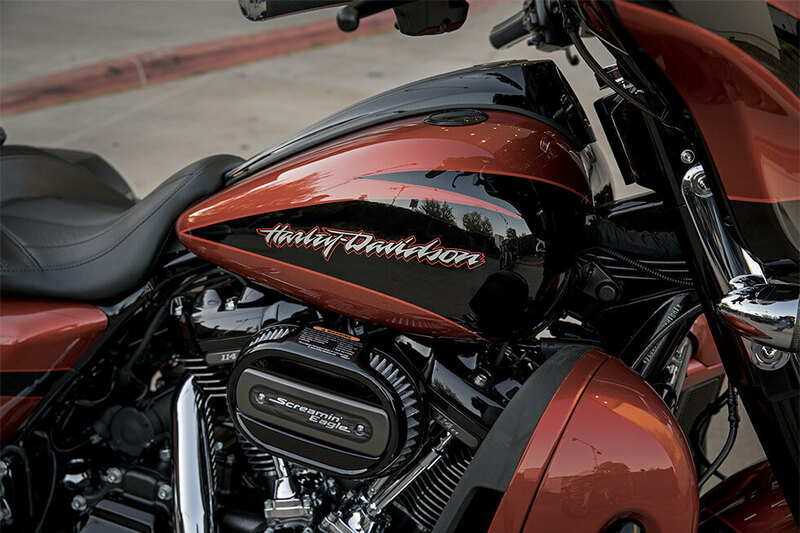 One-Touch Design Philosophy: In the CVOTM Street Glide®, everything needs only a single touch. The saddlebag lid and the fuel filler door are both easy to open with gloves on. 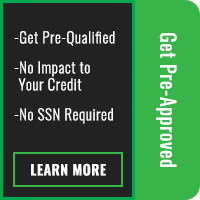 It’s a small perk that’ll make your life easier. Color Matched Slipstream Vent: There are plenty of touches that make the CVOTM Street Glide special, and the color matched slipstream vent is one of the many ways we customize the bike for you. 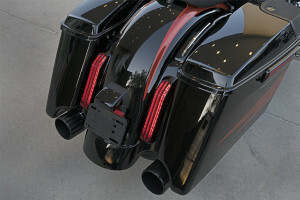 The CVOTM Street Glide® is fully loaded with custom features that make it distinct from the standard Street Glide®. 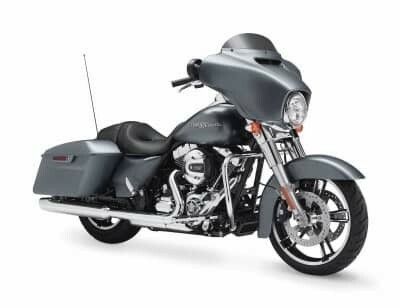 Color Matched Components: The CVOTM Street Glide gets a full complement of color matched components, including the fork and slider covers, the fairing skirt and more. Custom Low Profile Two Piece Seat: The seat on the CVOTM Street Glide is stylishly designed and custom stitched to provide comfort and confidence on the road and craftsmanship like nowhere else.